Shelby was told they her office would be closed because of the weather and thought we could have one of our bottles of spiced wine we've been holding onto. Well, more like forgot about the other year. That's beside the point. We rediscovered a bottle of Jamestown Cellars Settler's Spiced Wine from the Williamsburg Winery. We love the Williamsburg Winery because when Marleigh (see About) was younger she was a Highland dancer for 10 years and she would have competitions on the grounds of the vineyard. It always seemed to rain whenever the competitions were going to run. We learned that having a large piece of plastic in the trunk and a blanket made life a lot easier they events. The the name of the place brought back a lot of good memories. We opened the bottle and you could smell the spice as soon as the cork popped out. It had a nice color when poured and it tasted great. 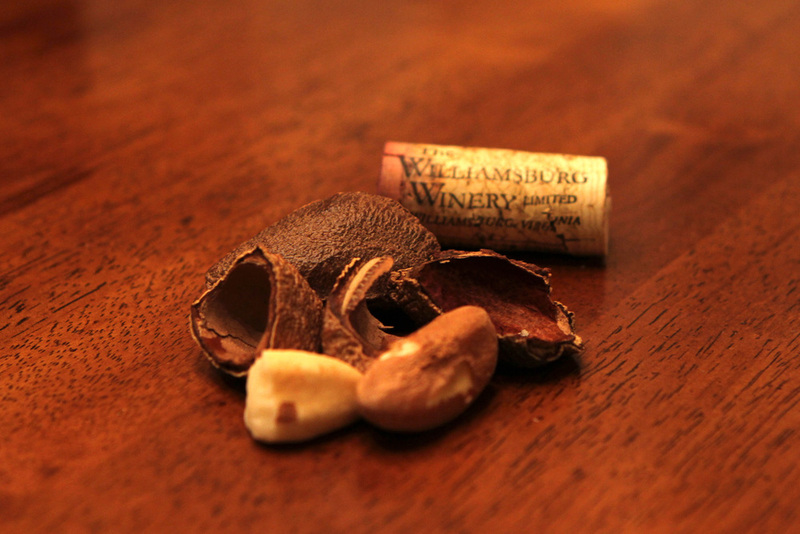 Shelby thought some nuts would go well with the wine, we pulled out the can of mixed nuts in the cabinet. Good idea. I liked the hazelnuts, Shelby liked the lone Brazil nut. The nuts and spiced wine reminded me of the Christmas markets in Germany. You could always count on Glühwein and roasted nuts at the Christkindl markts. I guess we could have tried warming up the wine but Shelby saw that it said to serve at room temperture. The wine was sweet and the spice was very pronounced. It was easy to drink but I don't know if I could drink too much of it at one sitting. It's a great seasonal wine that was well put together. Checking out the snow and sipping on something different was a nice change of pace.